100,000 years ago, some of my ancestors came out of Africa and arrived in the Middle East. 50,000 years ago, some of them reached Asia. But between those dates, about 70,000 years ago, two stars passed through the outer reaches of the Solar System, where icy comets float in dark space! One was a tiny red dwarf called Scholz’s star. It’s only 90 times as heavy as Jupiter. Right now it’s 20 light years from us, so faint that it was discovered only in 2013, by Ralf-Dieter Scholz—an expert on nearby stars, high-velocity stars, and dwarf stars. 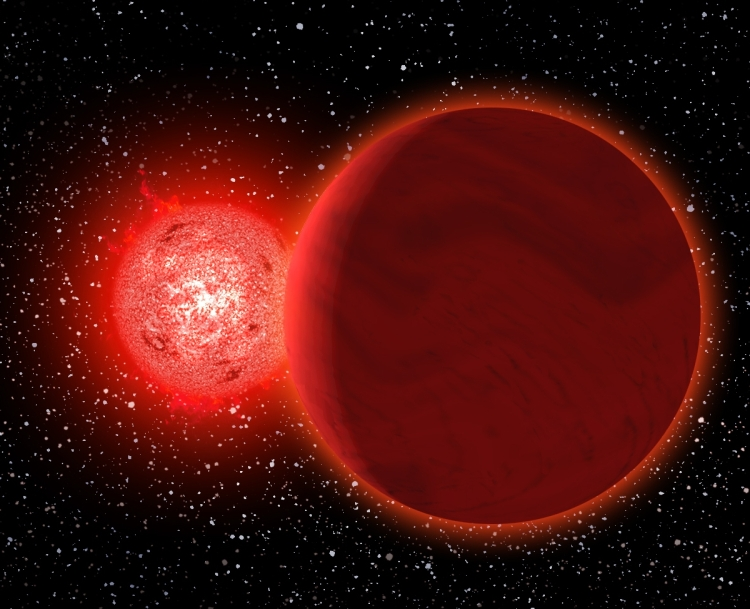 The other was a brown dwarf: a star so small that it doesn’t produce energy by fusion. This one is only 65 times the mass of Jupiter, and it orbits its companion at a distance of 80 AU. A team of scientists has just computed that while some of my ancestors were making their way to Asia, these stars passed about 0.8 light years from our Sun. That’s not very close. But it’s close enough to penetrate the large cloud of comets surrounding the Sun: the Oort cloud. They say this event didn’t affect the comets very much. But if it shook some comets loose from the Oort cloud, they would take about 2 million years to get here! So, they won’t arrive for a long time. At its closest approach, Scholz’s star would have had an apparent magnitude of about 11.4. This is a bit too faint to see, even with binoculars. So, don’t look for it myths and legends! • Eric E. Mamajek, Scott A. Barenfeld, Valentin D. Ivanov, Alexei Y. Kniazev, Petri Vaisanen, Yuri Beletsky, Henri M. J. Boffin, The closest known flyby of a star to the Solar System. • University of Rochester, A close call of 0.8 light years, 16 February 2015. The brown dwarf companion to Scholz’s star is a ‘class T’ star. What does that mean? It’s pretty interesting. Let’s look at an example just 7 light years from Earth! Luhman 16 is a pair of brown dwarfs orbiting each other just 7 light years from us. The smaller one, Luhman 16B, is half covered by huge clouds. 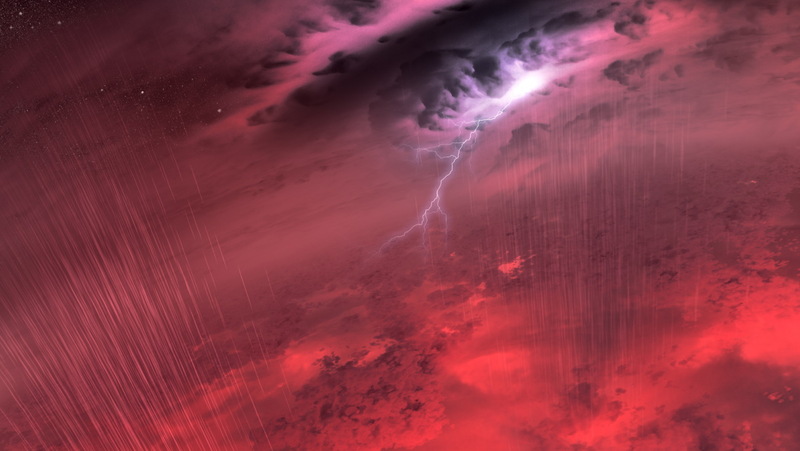 These clouds are hot—1200 °C—so they’re probably made of sand, iron or salts. Some of them have been seen to disappear! Why? Maybe ‘rain’ is carrying this stuff further down into the star, where it melts. So, we’re learning more about something cool: the ‘L/T transition’. Brown dwarfs can’t fuse ordinary hydrogen, but a lot of them fuse the isotope of hydrogen called deuterium that people use in H-bombs—at least until this runs out. The atmosphere of a hot brown dwarf is similar to that of a sunspot: it contains molecular hydrogen, carbon monoxide and water vapor. This is called a class M brown dwarf. But as they run out of fuel, they cool down. The cooler class L brown dwarfs have clouds! But the even cooler class T brown dwarfs do not. Why not? Finally, as brown dwarfs cool below 300 °C, astronomers expect that ice clouds start to form: first water ice, and eventually ammonia ice. These are the class Y brown dwarfs. Wouldn’t that be neat to see? A star with icy clouds! Could there be life on some of these stars? • Caroline Morley, Swirling, patchy clouds on a teenage brown dwarf, 28 February 2012. She doesn’t like how people call brown dwarfs “failed stars”. I agree! It’s like calling a horse a “failed giraffe”. This entry was posted on Thursday, February 19th, 2015 at 5:26 pm and is filed under astronomy. You can follow any responses to this entry through the RSS 2.0 feed. You can leave a response, or trackback from your own site. It is interesting, a planet with the core of a star. There are models for the starting of the life, one hypothesize the hydrothermal vent like a source of life. In a very cold Y-dwarf, if I understand well, there is a core that give enough energy to heat the surface, so I am thinking that must happen something similar to Jupiter: a constant mixing of colored cloud (observed chromophores), with a composition similar to that of the hydrothermal vents, and a possible mechanism for generating elementary life. It is interesting to imagine intelligence developing on such a dwarf that has been ejected from its home galaxy and is wandering through intergalactic space. Yes, it’s fun to read about intergalactic stars. Hmm, the prevalence of these stars may mean it’s tough to travel at relativistic speeds in intergalactic space! It seems there’s more junk out there than I thought. I’m not completely sure where the heat is coming from in Jupiter: gravitational contraction, or maybe chemical reactions? I’m sure people have theories! I’m curious about whether life could form in cloud droplets, assuming they were warm enough and had enough organic chemicals, with lightning to get things started. I’m not sure it can work! But of course I hope it can, because then we might have life on Jupiter-like planets and also Y-dwarfs. There are lots of these. I also don’t know how complex the organic molecules observed in Jupiter’s clouds are. They might say that, but we have no idea how many close encounters the Oort cloud suffered during the last couple of million years. 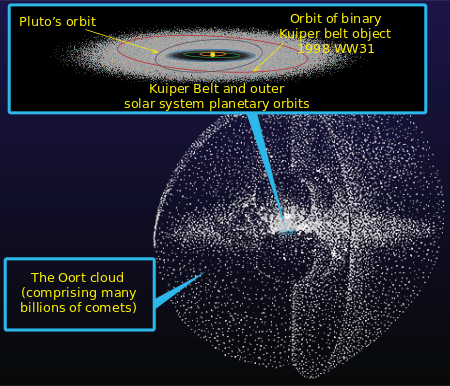 Even Scholtz’s star was barely detectable, older events have only left traces in the Oort cloud itself. The anthropic principle only guarantees there was no terminator event in our past, for the future it says nothing. The universe is a dangerous place indeed. We obviously need a fleet of Orion class spacehips patrolling the outer solar system, along with an ongoing all sky survey performed by large space based telescopes, sensitive in the far infrared. Near-Earth objects are much easier to deal with, provided we have the equipment to detect them. In that case we may have several decades to divert their orbit slightly, should any of them be on a collision course with Earth. That can be done by conventional spacecrafts and we have plenty of time to plan such a mission. It is not so with deep space objects, heading into the inner solar system from the Oort cloud. If such a swarm was initiated by some ancient fly-by and sizable objects are actually targeting Earth, there is no early warning whatsoever. If we are not prepared, we are doomed. If time is short, you need large acceleration for an extended period to meet the incoming object, then tugging on it gently at a small relative speed to divert it. Even if you have the spacecraft ready, only nuclear propulsion can deliver such a performance. Me and my 9 year old very much enjoyed the article. Thank you, John.